One of the main challenges new clients bring to Tigercomm is how to increase revenue through marketing communications (marcom). In the cleantech sector, high-ticket B2B sales have long lead times and often include a steep learning curve for potential buyers of cleantech products. The challenge of converting prospects into buyers is not unique to cleantech. But there are 5 major challenges nearly every company in cleantech must overcome to meet sales goals in today's new marketing landscape. Time is precious for every customer and as a result, time is also scarce, making it harder to get in front of prospects and hold their attention. The technological nature of cleantech sales steepens the client education curve especially for customers who are new to buying clean energy. Cleantech companies have historically underinvested in marketing communications – collateral materials, messaging tools and digital distribution channels. This underinvestment in marketing communications leaves companies unable to differentiate their products, leaving them vulnerable to price pressure from similar but inferior products and services. All of this places a tremendous burden on sales teams. We often talk with prospective clients about the legacy approach to sales – an approach that relies almost exclusively on the sales team turning strangers into buyers. We know that too many cleantech companies rely on the legacy approach to sales. Research shows this is ineffective and leaves teams far short of reaching their potential. At Tigercomm, we’ve adapted the legacy approach to account for today’s customer landscape. In Q1 of 2018, we’ll be releasing a white paper on how we’ve successfully adapted clients’ sales approach. 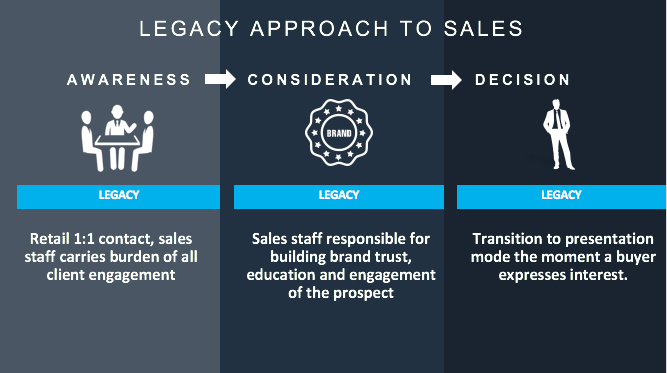 But before you read our white paper – ask yourself – is your company relying on the legacy approach to sales? UPDATE: We've released the white paper, you can download it Here.